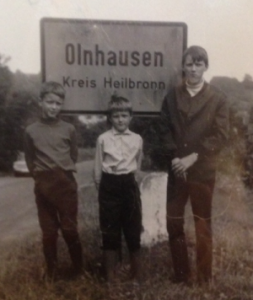 Olnhausen – a settlement of Ollan? Around the year 260 AD the Alemanni overran the Limes. The names of the settlements in the area of Jagsthausen correlated with the names of the clan chiefs. The names were added with the ending „-ingen“ for instance Sintero –> Sindringen. After the victory of Clovis over the Alamanni (496 AD) new places came into being distinguishable by the ending „-heim“ (Adelsheim, Rotigheim, ..). During the late Frankish colonization (7th / 8th century) successive Franks founded new villages with the final syllables „-hofen“, „-weiler“ and „-hausen“. The settlement of Jagsthausen seems to be among the oldest, as it was in earlier times only mentioned as „Husen“ (derived from „Hausen“), while all the rest were given a surname as a qualifier. This is also true for the place Olnhausen. Presumably then, the place was named after a clan chief called Ollan (Ollanhusen -> Ollinhusen -> Ohlhusen -> Ohlhausen -> Olnhausen). Olnhausen is first mentioned in 781 in a deed of gift (described in the Lorsch Codex) by which Sigemar of Ollanhusen gave all his possessions to the monastery of Lorsch. In the 12th Century the hamlet Olnhausen was given as a fiefdom to the sovereigns of Husen (Jagsthausen). When the dynasty of Husen became to extinct the exploitation right crossed over to the dynasty of Berlichingen. In 1806 Olnhausen became a part of the Kingdom of Wuerttemberg and thus independent. In 1972 Olnhausen was incorporated into Jagsthausen.